One of my New Year resolutions was to finally start doing short informative videos on various aspects of business law. Many social media consultant and other small practice firm friends urged me to do this, as I already do educational seminars for business owners. If you are in Honolulu on January 31st, you can come attend one. So the “Ryan Responds” videos are meant to be a quick reply to people’s FAQs about business law. They are not specific in-depth advice. So they are not a replacement for consultation time directly with an attorney. Rather they are meant to bite-sized and approachable for people that have general questions. /wp-content/uploads/2018/01/Ryan-Responds-Title-Screen.jpg 720 1280 Ryan K. Hew /wp-content/uploads/2017/06/hb-logo_websiteheader.png Ryan K. Hew2018-01-18 15:44:272018-09-17 12:01:54Ryan Responds: "Do I Need to Form a Business (Entity)?" Hey everyone, long time no see . . . been very busy, but I am grateful for all the business deals that everyone has been doing. It makes for an optimistic outlook in the economy and that there are a lot of creative people in Hawaii looking to be successful. Anyway, I am writing this post on Act 162 (SB1197 SD1 HD1) of the 2013 Hawaii Legislative Session because I am wondering did you file your General Excise/Use Tax Returns (more commonly known as GET)? It was due on July 20th for monthly, quarterly, and semiannual (so all three categories basically). Further, this Act even though it is so short highlights several key concepts to understanding government, law, and business. Specifically the following aspects: (1) the concept of “sunset” provisions and how legislation is tied together over the years; (2) how laws are enforced (namely through taxes and penalties); and (3) the applicability of the law to people/businesses who don’t think the law applies (cash-based businesses and the GET in this case). Act 162’s measure title doesn’t really help tell you what it does. All it says is “relating to tax administration” so I can see how someone may just gloss over the title. However, the description, which says “Deletes the sunset provisions for the special enforcement section of the department of taxation.” provides no insight either, unless you know what is the special enforcement section of the Department of Taxation. Before, I get to the Special Enforcement Section, let’s touch upon the first concept I mentioned, the “sunset provision”. So many times legislators are not sure about the effectiveness of a proposed law, it might be for a variety of reasons, may be the problem will go away, there is not enough money to fund the project, etc . . . so they put in a sunset provision, that is the law will repeal itself upon a certain date in the future (i.e. it will cease becoming law upon that date). If you are a contract buff, consider it like a specified termination date in the agreement. Notice the lined-through section? That is the sunset provision from the original law that was passed, Act 134 from session 2009, which now Act 162 (2013) is amending. So by strike-through, the goal of Act 162 is to delete that sunset provision from the Act 134 (2009) law. Since no new date was put in, rather they deleted the whole section, this would mean that now Act 134 (2009) is permanent. Click here to see the bill in its entirety. Notice, that Act 162 DELETES the sunset provision. The purpose of this Act is to provide the department of taxation with the necessary resources and tools to target high-risk, cash-based transactions to shore up confidence in Hawaii’s tax system for those that do comply. Importantly, the legislature intends that the enforcement resources provided focus on the civil collection and enforcement nature of Hawaii’s tax laws. In an effort to demonstrate the targets of this undertaking, this Act defines “cash-based business” for enforcement purposes, and the department of taxation is directed to focus on such businesses. At the same time, education is equally important as enforcement. Therefore, this Act requires the department of taxation to reach out to industry groups, specific demographics in the economy, and practitioners to educate taxpayers on their tax responsibilities. While this is only describes the purpose, an in-depth look at the provisions of the bill would show that the Special Enforcement Section was created in the Department of Taxation and that its powers included investigation, enforcement, etc . . . for violations of the tax code, specifically targeting “cash-based businesses”. Now what businesses primarily deal in cash? You would probably think those vendors who are at farmers markets, craft and fairs, and swap meets. You would be right because the since the creation of the Special Enforcement Section they have investigated numerous cash-based vendors and found that when asked for their tax license, they had none. You can see some of the specifics from the Section’s reports by clicking the following for: (1) July 1, 2009 through June 30, 2010 and (2) July 1, 2011 through June 30, 2012. What you should take away from all of this is that if you are a cash-based business, you should realize that the deletion of the sunset provision effects you because the Special Enforcement Section of the Department of Taxation has been made permanent. So it will continue to investigate and enforce penalties against you, if you are in violation of the law. Primarily focusing on the fact that if you do not have a tax license to conduct business you will pay a penalty. What’s the Penalty for Not Having a Tax License? Any person who receives gross income or gross proceeds of sales or value of products from engaging in business in the State and who fails to obtain a license or receives gross income or gross proceeds of sales or value of products from engaging in business in the State without a license required under this section may be fined not more than $500; provided that a cash-based business may be fined not less than $500 and not more than $2,000, as determined by the director or the director’s designee. The penalty under this subsection shall be in addition to any other penalty provided under law and may be waived or canceled upon a showing of good cause. So as a cash-based business can you afford penalties like these? I know, I can hear it right now, as I have with many clients, “X law does not apply to my Y situation” . . . well, to be honest your focus is perhaps cooking delicious food for people or creating a unique piece of art, but your craft is not the practice of the law (lawyers) or the application/enforcement of the law (government agents), so how can you be absolutely sure the law does not apply to you? “Business” as used in this chapter, includes all activities (personal, professional, or corporate), engaged in or caused to be engaged in with the object of gain or economic benefit either direct or indirect, but does not include casual sales. (2) Tangible personal property which is not ordinarily sold in the business of a person who is regularly engaged in business. your business is your business, but the applicability of the law is for enforcers and practitioners, however they can help you make better risk management decisions based on these laws. At the end of the day consider seeking professional (law, tax, and accounting) help to make determinations for your cash-based business. As you’d rather be paying taxes on time rather than paying penalties and taxes for trying to avoid a law that you did not think applied to you because you were just taking cash or viewed yourself as “casual”. It might be the time to register your LLC or corporation, update your accounting practices, or make better financial decisions in light of your taxes. Mahalo for staying through this lengthy post! Need instructions on filing your returns? Click on this link to be taken to the State of Hawaii’s Department of Taxation’s General Instructions. Considering getting a LLC or Corporation because your cash-based business needs it? Review my downloadable one-sheet. If you are a more visual person take a look at this infographic. LEGAL DISCLAIMER: The information provided here is meant to be general information, and should not be taken as specific legal advice that pertains to any particular situation. The reader should not base any decisions on the information here to act or refrain from acting regarding a legal problem. If you believe you have a legal problem please seek legal advice from a licensed attorney in the relevant jurisdiction. Summary: Generally, speaking states are moving to prohibit employers from asking for usernames, passwords, and access to an employee’s or potential employee’s personal social networking account. The argument goes that they need access to the personal accounts as a way to protect proprietary information, trade secrets, to comply with federal or trade association regulations, or to prevent an employer of being exposed to legal liability (due diligence). The countervailing argument is that the personal account has nothing to do with one’s application to a job or doing the job, and is an invasion of privacy. Thus far, it seems privacy advocates are carrying the day as four states last year, Illinois, Maryland, Michigan, and the latest California have adopted laws that prevent employers from accessing personal social media accounts of employees or potential employees. Hawaii’s 2013 legislative session has two bills fashioned after California’s. Federal: Representative Eliot Engel of New York has recently introduced H.R. 537, the ‘Social Networking Online Protection Act’ (SNOPA). The bill if enacted would prohibit employers from requiring/requesting that the employee or applicant provide the employer their user name, password, or other means for accessing the employee/applicant’s private email account on any social networking website; OR discharge, discipline, discriminate in employment or promotion, or take adverse action against them for refusing/declining to provide a user name, password, or access OR if the employee/applicant files a complaint under the Act (basically asserting their right to sue to protect themselves). Finally, it gives the US Secretary of Labor to assess a civil penalty of up to $10,000 for violations and stopping the violating actions. Further, US district courts can give relief to the affected person through employment, reinstatement, promotion, and the payment of lost wages and benefits. State: During this 2013 Hawaii Legislative session, two bills, HB713 and SB207, work for the most part, very similar to the Federal law, and the language is based mostly on California’s recently adopted law. I will focus on HB713 as I have worked with this bill in particular. The current incarnation of HB713, is an HD2 that was passed out of the House Judiciary Committee, yesterday (2/21) and basically uses broad language to prohibit an employer from asking an employee or potential employee their user name, password, or trying to get access to their personal social networking account. Currently, the HD2 would have the Hawaii Civil Rights Commission investigate a claim, and would operate similarly to any other investigation that the Commission already does for other issues under its authority. Prior variations had DLIR handle the investigation. Bottom line: This issue is not going away, and it is clear that as time goes on it is more likely than not employers will be denied access to personal social media accounts. However, this still does not prevent workplace investigations and other necessary steps when there may be a violation, and the social media account is involved. For example, situations where there is workers’ compensation fraud or the wrongful transmission of trade secrets. The best situation for employers is still likely that workers use their personal devices and personal time to do their personal social networking, and not on company time, company devices, and company email accounts. As always check with attorney or HR specialist on policies and procedures. Summary: The National Labor Relations Board (NLRB) continues to apply the National Labor Relations Act (NLRA) to situations where the employer has taken adverse actions against employees due to postings on social media sites. Further, it has frowned on overly broad social media policies by companies trying to regulate employees’ social media behaviors. However, a recent DC Court ruling has stated that President Obama’s recess appointments to the NLRB were invalid. However, this should not be taken as a sign that employers can ignore the recent rulings on social media policies and firings. However, in The Arizona Star Daily situation, a reporter that had posted Twitter comments stating that “What?!?!?! No overnight homicide. … You’re slacking, Tucson.” Another began, “You stay homicidal, Tucson.” was not protected as those comments were offensive, and not concerted activity, nor about working conditions. Similarly, an Illinois bartender fired for posting on his Facebook that he was unhappy about not receiving a raise in five years and calling customers “rednecks” and that he hoped they chocked on glass as they drove home also did not meet protective-worthy status. While, it is hard to draw any clear distinctions, it does seem clear that employers should adopt social media policies that are specific rather than impose across-the-board prohibitions; the NLRB seems to take into account chilling effects on speech in concert by workers through social media platforms, especially where working conditions are touched upon. However, a worker’s general gripes and disparaging comments about customers or groups of people will less likely be protected under the NLRA. Overall Reminders: Recent court cases have indicated that a series of emails can be taken together as a contract. Therefore, when engaging in employment activities, such as using LinkedIn, recruiters or HR persons should be careful not to make a written offer. Also social networking is becoming a part of people’s everyday Internet interaction. By now it is clear that information is permanent when published on the web, as many people can screen capture, take a picture with their mobile device, etc . . . so companies should take great care when using social media as delivery system for information. While this is a concern for marketing and PR, HR should remember it has the responsibility of dealing with the pieces of terminating, disciplining, and investigating the marketer or executive who creates the firestorm on social media. Therefore, all decision-makers in a company need to understand social media policy. Hope you are having an awesome Friday for this last aloha Friday of 2011. I just wanted to take the time, as I close out for the day to wish you all a happy and safe New Year’s Eve and for a start of a good New Year. In addition, I would like to thank all my friends, acquaintances, clients, readers, supporters, and yes even my Twitter followers for making 2011 a good start for me. I appreciate getting to know you all in the various settings that I have and welcome meeting new people and reconnecting with old friends whether it be in social media, IRL networking, or for coffee. Also thank you for allowing me to tell you all my story and journey of an attorney that loves the intersection of law, business, and politics in the realm of small business and startups. Leadership – still have two posts left from this year! Although like all good growing businesses, their ideas change and grow I will be rolling out new features and ways to get information into struggling business owners’ hands. In fact, I’ll admit that being an attorney who just started going solo there were times I wish there were resources for me, and there were, but I will continue to try to deliver information to the people who want its and need it. I would like to thank various people and organizations that have given me feedback before I talk about my 2012 features. Thank you to my friends at Off-Menu Catering, all of you give so much support and thoughtful feed back to carry me through continuing to serve small business. Thank you to The Greenhouse: Innovation Hub and in particular Doc Rock (@docrock) and John Garcia (@johngarcia) for creativity and inspiration, Jill (@swamwine) of SWAM, Danny (@wangchungs) of Wang Chung’s, and Shawn of Small Business Planning Hawaii (@SBPHawaii) for bouncing ideas off of to deliver services and information to small business owners. Melissa Chang (@Melissa808), Jennifer Lieu (@jlieu), and Capsun Poe (@capsun) always guiding lights for social media use. Mahalo to the Young Lawyers Division, HSBA, and Leadership Institute for providing guidance to an attorney. To fellow attorneys Wayne J. Chi and Scott C. Suzuki thank you for doing talks with me, some more planned in the future! To William (@alohastartups) of Alohastartups.com, much thanks as you are providing a great resource for startups in Hawaii and I am excited for the plan in 2012. However, I think I still owe you a post from 2011! Thanks to Rechung (@TheBoxJelly) of The Box Jelly for providing a space for legal talks and helping Hawaii coworkers. Finally, thank you to Marcus Landsberg, a fellow Hawaii attorney that has helped out and set down this path of being a solo practitioner like me and showing that solo does not mean alone. PODCASTS – that’s right Hawaii small business owners, no worries if you cannot make it down to one of my talks! I will be providing portions of them for you to watch in your store or at home. One-sheets – simple pdfs talking about one particular issue for you to download, print, and share. Newsletter – I am not sure what the frequency will be, but definitely watch your e-mail inboxes! REVAMP of blog and website – I will be shifting gears and making sure that I deliver to you content in a more user-friendly style! That’s it for this year! Have fun and be safe this New Year’s Eve and see you in 2012 (Year of the Dragon!). Today’s New Law in the Brief focuses on a serious new law that helps out people in an unfortunate situation.Act 206 is aimed at creating a protected status for those who have been a victim of domestic violence. Some of you are probably are questioning the need for such a thing because a) you thought this was a already protected status or b) thought what kind of employer fires someone for being the victim of abuse. Sadly, that was not the case in the State of Hawaii and it was only this year that an employer is prevented from discriminating against those who have been victims. You may ask who is callous enough to fire a woman who is being beaten? Well, the sad truth is that actually is the case and this news post from The Maui News shows this to be the case (and discusses the new law as well). Act 206 will go into effect next year, January 1, 2012. The law will protect victims of domestic or sexual violence from employers discriminating against them from status. In general, it aims to prevent wrongful termination or suspension, as was the cast in the Maui News story. However, for the victim to be availed this protection the employer has to be notified from the victim or have actual knowledge. Furthermore, the employer must make reasonable accommodations for the victim, so long as it does cause an undue hardship. The law is very much fashioned similar to the ADA. The employer is allowed to request verification of an employee’s continued status. In many cases, a Temporary Restraining Order (TRO) is issued and does end at some point or the victim’s persecutor is put away, and thus the need for protection ends. Finally, the law also creates a civil remedy (money) for employee-victims denied their reasonable accommodation under the law. provided that an employer shall not be required to make the reasonable accommodations if they cause undue hardship on the work operations of the employer. An employer may have to do all of these or some of these, but remember the standard is “reasonable” accommodation, thus whatever is necessary to protect the victim-employee and make them feel safe should be implemented to the employer’s ability without it impacting their operations. If an employer is already experienced in handling ADA reasonable accommodations many of these changes and the kind of process you have to go through should seem familiar. However, the slight difference here is you are kind of protecting the identity and safety of the victim, so that the person harming them cannot find and harass them. Also when handling this kind of situation, remember your obligation to keep a safe work environment for ALL your employees. Thanks for following my New Law in the Brief posts. Law in the Brief will be going from regular posting to special posting until next year. This does not mean there are no new laws in Hawaii. In fact, there are a 235 Acts from this past legislative session. You can check them out here. Just click Law in the Brief, to see the past posts. As always, don’t forget to “Subscribe” to this blawg do so by clicking the little orange button up in the right-hand corner of the page. just a reminder to come join me at the Box Jelly tomorrow night 10/18 for a talk on “Protecting Your Brand.” The subject will be a discussion of various intellectual property laws that a small business owner should understand as they grow their business. Here is the link for more info. Today’s law in the brief shows exactly why definitions play a role in the application of the law. If you attended my talk on Business Entity Formation you would know that when you choose to operate a business there are many forms you can choose from. Each has its pro and con. Many times the pros and cons come with dealing with things like taxation and the way benefits are handled by the entity. Act 196 tries to specifically clarify one of these areas. Namely, that LLC members, partners in partnerships, and sole proprietors are NOT defined as “employers” for the purposes workers’ compensation. (13)Service performed by a sole proprietor. people in those situations would not be treated as an “employer” for workers’ compensation law. A business owner who is not actively involved in the day-to-day activities of the business most likely would not suffer a work-related injury and therefore would not benefit from workers’ compensation insurance. Even if the owner does work at the business, there would be little or no gain to file a worker’s compensation claim, which would result in increased premium costs borne by the business. In the case of a sole proprietorship, an injury would likely result in the termination of the business operations. Admittedly, worker’s compensation insurance imposes additional costs on the business. This exclusion would provide additional and much needed financial resources to the small business person. Taken from Testimony before the WAM Committee on HB518 HD1 SD1, 04-01-11. To the readers on the mainland, Happy Columbus Day and to my local Hawaii readers, Happy Discovers’ Day! Anyway, today’s new law in the brief will be brief once again. As many of you know next week will be another talk at Hawaii’s first coworking space, The Box Jelly. Thanks to all of you who helped pick the topic of Protecting Your Brand: An Overview of IP Laws by voting in my poll with The Box Jelly. Be on the look at this week at Aloha Startups website, as I will do a post related to that subject. Also as I was doing research for today’s new law I noticed that the state legislature updated its website. Check it out here. It has that kind of app-store kind of feel to it. So what other news is buzzing around town? Well, Hawaii’s new beekeeper registry. For you apiarists House Bill 866 signed into law (Act 200) is designed to provide a volunteer registry administered by the Hawaii Department of Agriculture. As many of you know a there are a lot troubling things affecting the bee populations. Things like bad weather, the infestation of varroa mites, nosema spores, and small hive beetles all have led to unofficial counts indicating that thousands of bee colonies in Hawaii have died off. However, this may be inexact and state agricultural officials did not compile statistics on the production of queen bees in Hawaii. This was partly due to the fact the industry is small and also because of issues relating to proprietary information. finally, the goal from the aggregated data is for the Department of Agriculture to promote the industry. Anyway, if you are beekeeper and would like to take advantage of this here is the form to fill out. For other Bee News check out this link and this one. P.S. You may be wondering why I care so much about bees, as I kind of hinted at it with B-Corporations Law in the Brief posts. Well, as a foodie I realize that bees are largely responsible for the great bounty of plants that we find on or plates and table. We as humans have no way of replicating what bees do for agriculture so this is an important step in combating the threats to our food production. Also don’t forget to “Subscribe” to this blawg! Today’s new law is brief and simple, something probably that those in the real estate industry can appreciate given the context of Act 212. Sorry for all the paperwork realtors, but you know us attorneys, we would like to have everything documented, recorded, and filed property! What Does Act 212 do? Simple, the legislature inserted an exception into HRS § 466K-4, which sets the standards for real estate appraisers. (3) If the real estate licensee receives compensation related to the sale of property, the licensee shall not receive any additional compensation, fee, or other consideration for providing an opinion as to the estimated price of that property. and finally, if you receive compensation connected to the sale of property you do not get anything else form providing an opinion to that property. Yes, this law is already in effect. Over the last several years, due to the economic crisis, loan delinquencies have increased,which in turn have required more estimated analysis to determine the market price of the collateral for these delinquent loans. Thus, each property that falls into distress may need atleast one price opinion, and more often two or more price opinions, to determine the mostappropriate disposition of the property — whether it be loan modification, short sale, orforeclosure. For example, a lender might use a price opinion to determine whether a short sale transaction should be approved, or whether a delinquent loan should be modified. In thesetypes of situations, the price opinion can assist with the decision to list, offer, sell,exchange, option, lease, or acquire real property in a real estate transaction, or alternatively, help struggling homeowners stay in their home. Anyway, realtors enjoy giving your opinions, now you can become opinionated like an attorney! Thanks for reading this post and be sure to look for my next post. It will be a poll to choose the subject matter for my next talk to be held at The Box Jelly! As a transactions attorney that drafts agreements for businesses I have found that explaining what certain clauses do is beneficial to the client and organization. 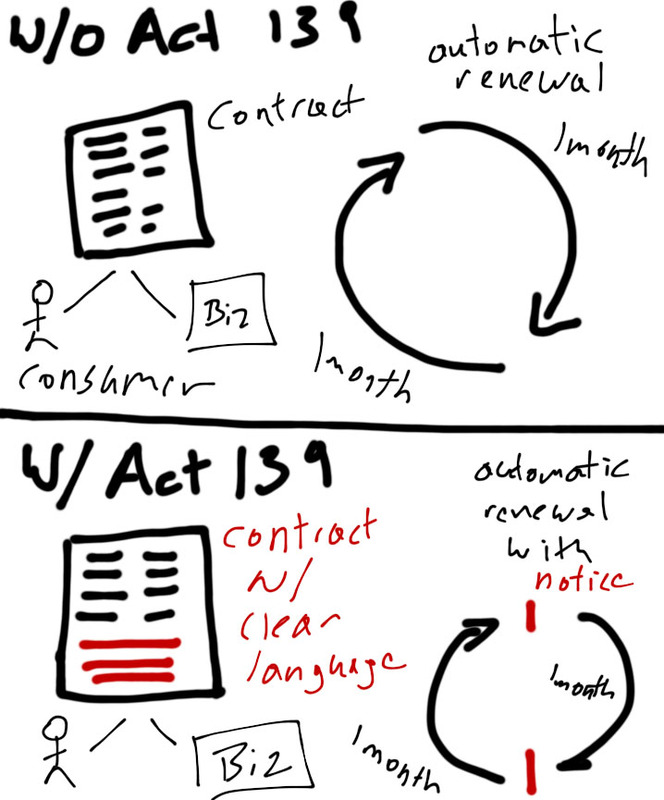 Therefore, today’s Law in the Brief covers Act 139. Also lookout in the future I will be doing little posts on boilerplate language to help you understand what is going into an agreement. use of clear and conspicuous disclosure of automatic renewal clauses and cancellation procedures for all consumer contracts and offers with an automatic renewal provision and additional disclosure for contracts with a specified term of twelve months or more. This new law will be assigned a number under Chapter 481 of the Hawaii Revised Statutes, which is the Fair Trade Regulations chapter. Specifically, it will be under Part I, the Unfair Practices Act. Currently, there are about eleven states that have enacted similar disclosure requirements at the inception and immediately prior to the renewal of the contract type of laws. The lawmakers hope is that with the use of “clear and conspicuous” language (as defined by the Federal Trade Commission’s standard) that this gives consumers a change to be fully apprised of the situation. Namely, that there is an automatic renewal clause and what steps they have to take in order to stop the contract from renewal. Basically, this is an attempt to shift the burden back to the entity issuing the contract so that consumers may not be bound to a contract for a period longer than they anticipated or finding themselves stuck with something they do not want. Do you let the consumer know what the terms of automatic renewal are? Is it clear and conspicuous in the agreement? Do you have a system that monitors contracts and sends out notices when their term is almost up? set off from the surrounding text of the same size by symbols or other marks in a manner that clearly calls attention to the language. If you liked this post or any of my other series please “Subscribe” to this blawg to receive e-mail updates. I would recommend subscribing, as I will be doing the Boilerplate Blurbs (explaining regularly used clauses) sporadically. In addition, follow me on Twitter and “Like” me on Facebook. If you need to contact me directly, please e-mail me at Ryankhew@hawaiiesquire.com.